Life is still very busy here (as per usual) but I did manage to do a little more stitching so I thought I would share what is on my hoop. As you can see I am half way through doing woven zig zag chain over the ric rac that is just below the doily – it takes an age! What have you done this week that takes you towards your stitching goals? Leave a comment and let us know. 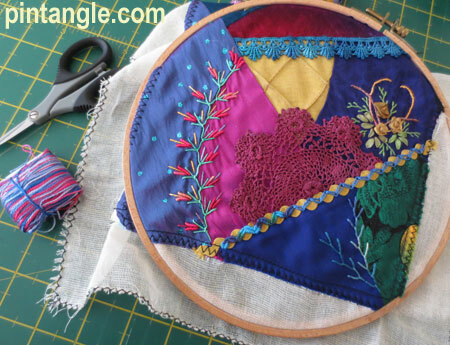 As a side note for those interested in the mini challenge: The idea is that people design their own sewing caddy or hussif in any style of quilting or embroidery. The is no deadline. I presented some informal guidelines here . Thanks for all the compliments folks – They are nice to wake up to! I love the flowers on the left from feather and bullion, very clever use of the stitches and so pretty. Lovely piece in all. I have made my body , a clever little round pocket for tape measure, some silk pockets I need to embroider. Forgot to take photos. Very beautiful work, Sharon. I have managed to get some construction basics done the last few days. With that out of the way I can begin hand embroidery and embellishing. You can see my progress here, http://crazyvictoriana.blogspot.com/. I love how the woven zigzag looks Sharon. Yes, woven zigzag chain takes a lot of time. For me the weaving is very relaxing, just stitching and watch it grow. Again no progress on my TAST 2012 fabric book, I only decided which fabric to use on the inside of my cover! I forgot something important about my finished hexagon quilt. I started this with the “Take it Further” challenge Sharon did several years ago – then kept going. I wouldn’t have that quilt without this blog. Sharon, that so much for doing this blog. Every bit of stitching helps achieve the end result. Sharon, You are working on a ring frame again. what happened to the Grip-n-Stitch one? Did you experience problems with it.? I love mine for medium size projects. I bought 2 sets thinking that combined would be satisfactory but found that there is an optimum size which!!! is slightly larger that one set provides. I had no problems with the square frame but only have one set and this wont fit on it! Woven zig-zag chain takes a long time to work but it is well worth it! The variegated thread looks lovely against the yellow ric rac.